Some fantastic footwear for the spring (and summer) - Well Dressed Dad - It is a proper menswear blog. Like, with original words and opinions and suchlike. Hot on the heels of my spring jackets guide comes this, the unmissable guide to footwear for the spring season. Now, those that have been following me for a while know that I don’t do trainers or running shoes, apart from when I’m working out or running. And when it comes to style trainers really are not in my game. So this feature only includes proper shoes. And boots. Proper boots as well. Yes, boots in a spring and summer guide. Just in case we have weather. So, what we deal with here is footwear for men. What characterises footwear for men? For starters, it’s likely to have leather uppers, complimented by proper soles, most likely a welted construction, and let’s face it, they’re probably not cheap. The thinking here is to buy good shoes, shoes that will last, shoes that look good, shoes that will provide good service, and shoes that can be resoled if you wear out the soles. I mentioned that they were unlikely to be the cheapest, but thinking long-term they will probably work out cheaper than the pair of low cost cheapies that will junked at the end of the season. Are we on the same page? So, first some shoes, then some boots. Yuketen is the brainchild of Yuki Matsuda, who is also behind Monitaly, a brand favoured for the Mountain Parka. A master of details, Yuki takes inspiration from classic Americana for his boots, but with added details and features. 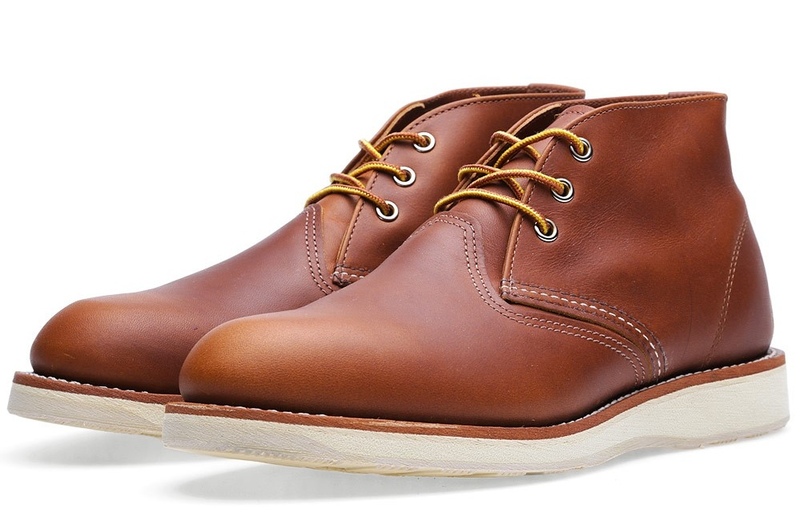 The Maine Guide boot has been available for a few years, but the lower height Oxford version is new. As expected the materials used at top of the line, with an superb level of finish and workmanship. This version has a Vibram ripple-sole which looks incredible and must be very comfortable when out strolling. 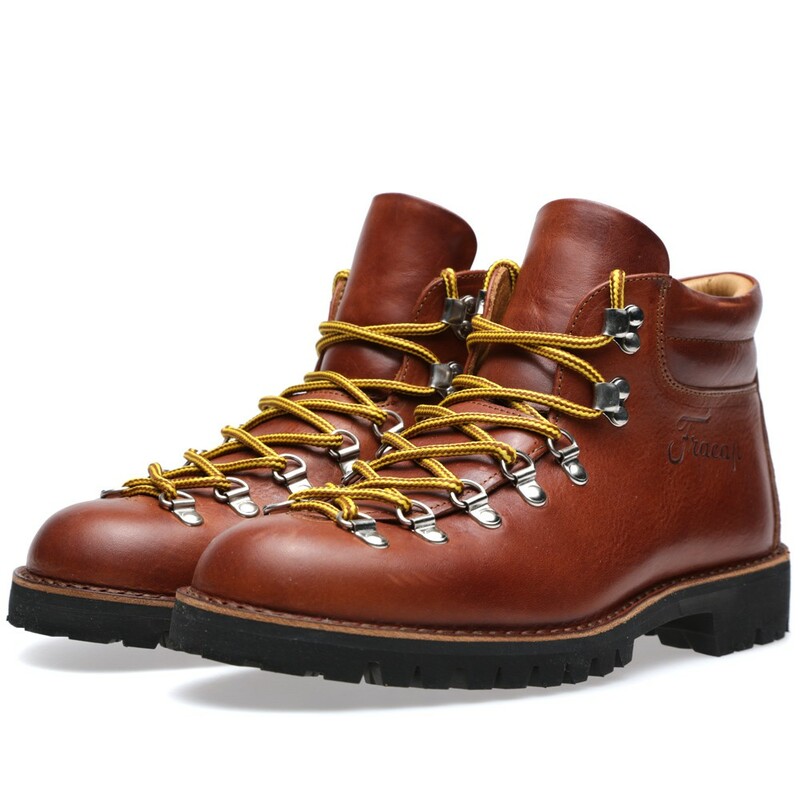 The thick leather laces add to the rugged look, as do the brass eyelets. Hand crafted in the USA. The shoes a lot of us remember from our childhoods are back, or should I say the shoes we remember from falsely implanted memories of them. 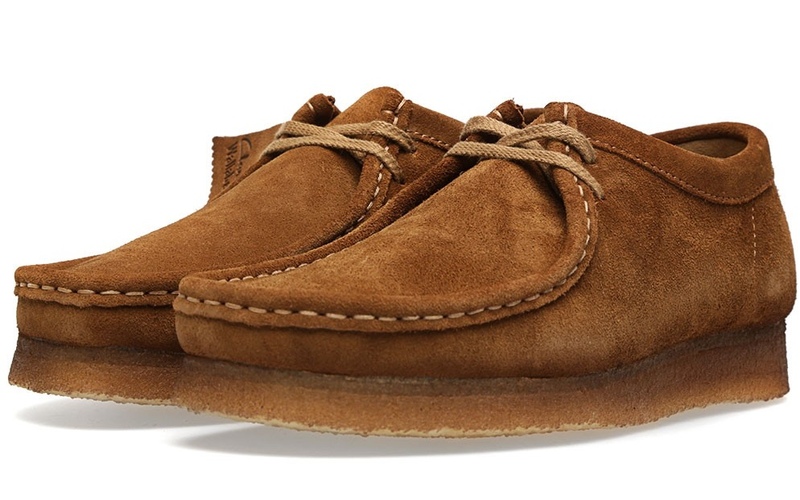 The Clarks Wallabee is a British classic, with the suede uppers and the crepe wedge sole. The rereleased version is to the exact replica of the original, and while I’m not entirely sure I remember the original, I do rather fancy it now! One point against the Wallabee is that once they’re worn out, they’re thrash. No welted sole. Still, at around 75 pounds, they’re not bad value. And that suede upper does look suave. No info on where they are made. Next up are the entry from Paraboot. An outsider entry by Scratch in the winter boot roundup, Scratch has again requested that Paraboot are included in the Summer roundup. This time with the Michel Marce model. 100% leather upper, full grain leather lined inner, super durable rubber sole and a cushioned footbed. And the welt of course. No run of the mill Goodyear welt on these, it’s a proper Norwegian welt with dual stitches. This is a good thing. The moccasin style may be in danger of being on the verge of hipster these days, but they look good with jeans and definitely go with the rugged style. And they’ll last a long time. Made in France, with care. And now we’re into the realm of my favorites, the brogues. 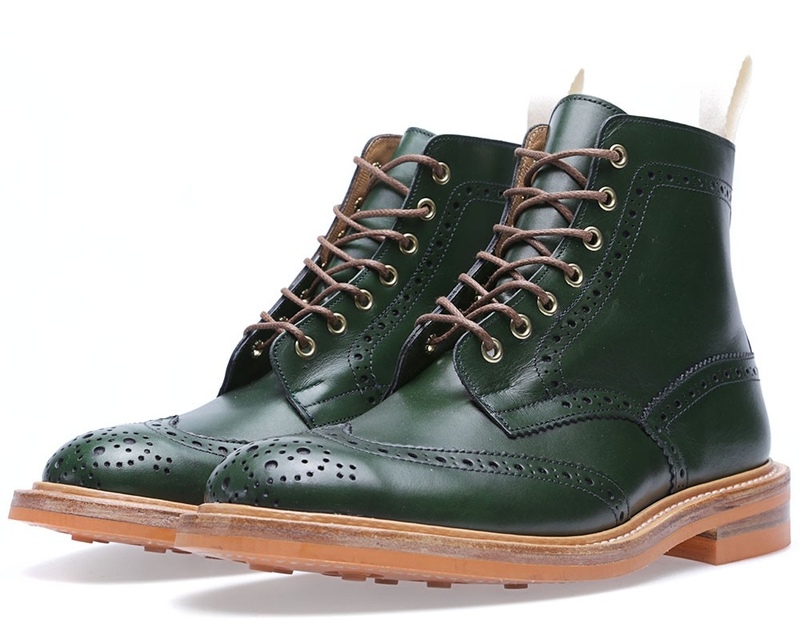 Last summer I was raving about the Grenson X Barbour Marske country brogues with their sturdy commando soles. 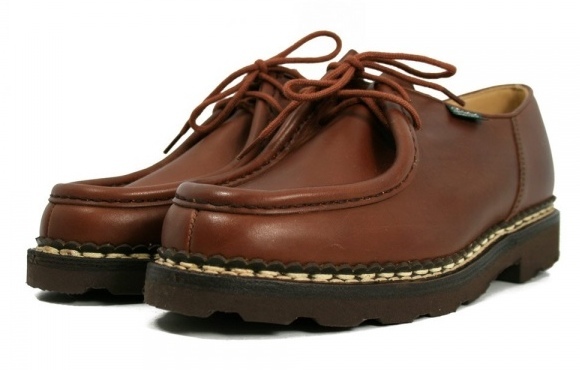 They are no longer available, but the Grenson Archie makes a fine alternative. Grenson being one of the more notorious of the British shoe makers these days, bringing innovation and fresh thinking to what could be considered a rather staid industry. This Archive is definitely on the rugged side, not only with the sturdy sole, but also the full grain uppers and oversized detailing of the brogue patterns. The construction is the expected Goodyear welt, so you can resole them if you manage to wear out the sole. Leather lined, rolled wax laces and a canvas heel pull. At least partly made in Great Britain. Red Wing seems to be everywhere these days. The chukkas I’ve selected here are a variant I see quite regularly on the shelf at the local Red Wing outlet and every time I see them I stop to think how good they look. Inspired by their more rugged heritage-style boots, this is much more casual and combines the classic Oro-colour leather with a white Vibram sole and white contrast stitching. The usual signature two-tone lacing is of course included. While I’m not sure how long the Vibram soles will last, they’re sure to be very comfy, and with the Goodyear welted construction, at least they can be replaced. Made in the USA. 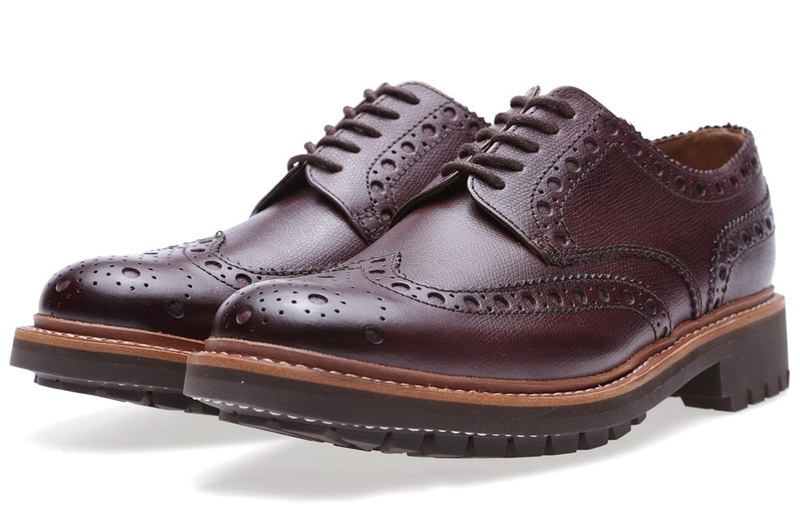 From Grenson’s badboy Archive brogues to a more subtle pair from Sanders & Sanders. Sanders & Sanders is another of the traditional and respected shoemakers, though are less about innovation and more about tradition. 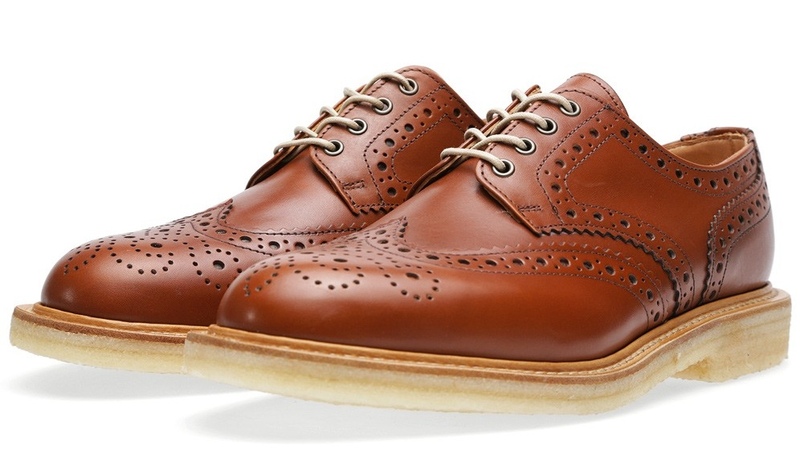 Tradition hasn’t stopped them putting crepe soles on this fine pair of brogues though. 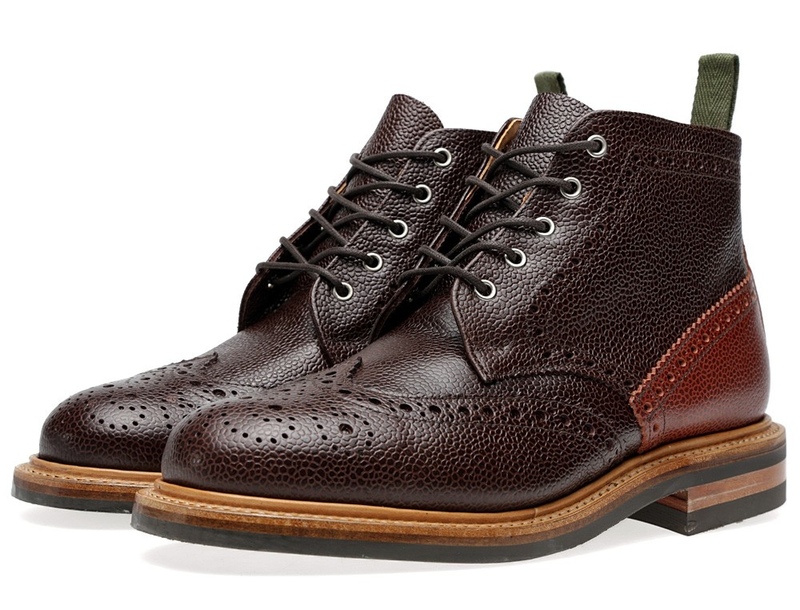 The Alfie has a traditional wingtip brogued detailing, with supple leather uppers, Goodyear welted to the crepe sole. A natural leather lining adds to the comfort. If commando soles are just that little bit too much for you, the may be just the thing. Made in Great Britain. Our first boot in the selection is something a little different from Italian shoemakers Fracap. 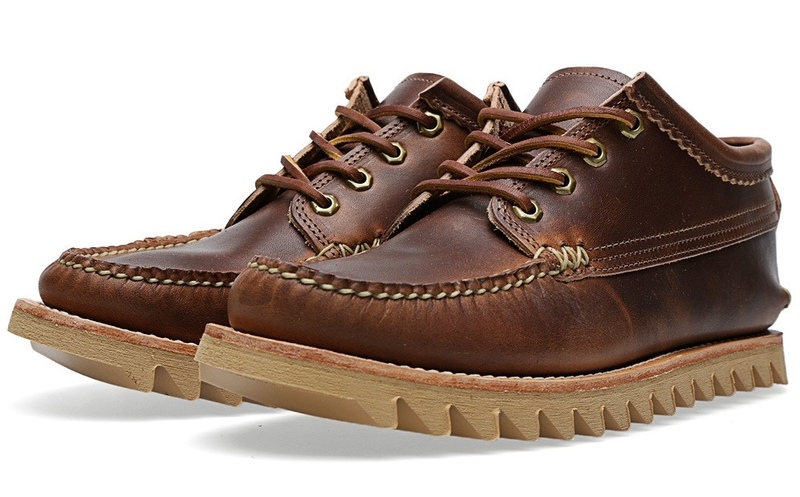 A low boot, with a fabric and vegetable tanned upper, over a white Vibram sole. The combination of the mountain boot style rugged lacing (which is one of the mainstays of Fracap, witness the fantastic M127 boot in the AW footwear guide) with the classicly styled longwing brogued leather makes for a very interesting and different design. Available in many different colour combinations direct from Fracap. I like it! From one pair of Sanders-made brogues to another. This pair are designed by Mcnasty himself, Mark McNairy, and are part of his New Amsterdam collection. 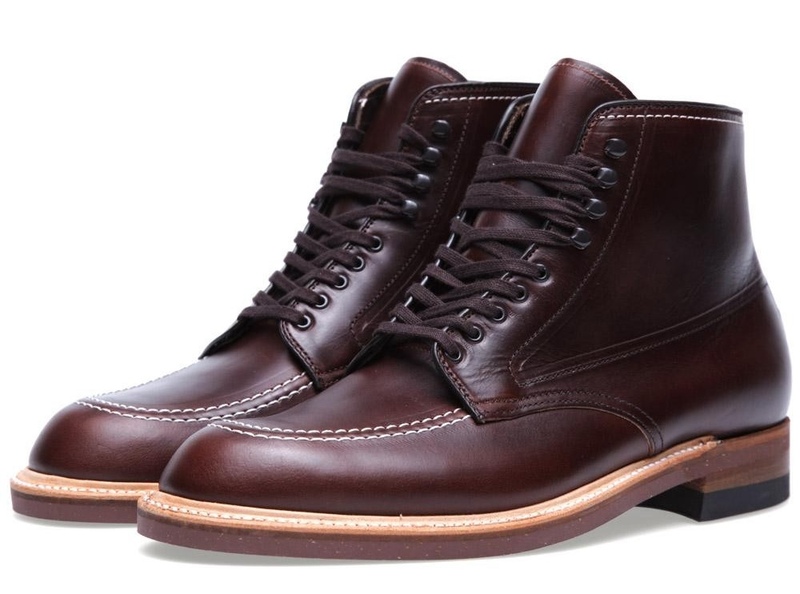 McNairy has a good eye for innovation and detail and combined with Sanders & Sanders traditional quality and heritage this turns out to be a rather attractive boot. Hand made in Northampton, the commando sole Low Boot is a nice update of the traditional brogue with the contrasting panelling and sole. The sole being a Dainite sole here, where we may have expected a Vibram. The laces are of the rolled variety and there is a canvas heel pull to help you pull them on. Goodyear welted, naturally, so these will last a long time (unintentional shoemaker joke). As mentioned, very much made in Great Britain. Second last on the list is this Alden boot, the 403, or the “Indy” as it’s most commonly known after being worn by Harrison Ford in the series of “Indiana Jones” films. This in itself would be enough to have a every guy who ever saw the films desperate to wear the same, and probably quite a few of the girls as well. Add in the fact that these are quite superbly styled boots, with a very pleasing combination of clean design and subtle details, with a build quality that is second to none, and you may wonder why they aren’t the most common boots around. Well, the build quality, the Horween Chromexcel leather, full glove leather lining and quality eyelets and speedhooks do mean they are on the spendy side. There is also something Alden call a Foot Balance heel, which adds enhanced comfort and durability. Just the ticket when dicing with throngs of nasty Nazis, no doubt. Goodyear welted, naturally, so with care these will last a long time. Made in the USA. And we arrive at the last boot on the list, and it’s a mighty one. Trickers is known as one of the greatest names in shoemaking, like Sanders and Grenson having their factory in the shoetown of Northampton. This is a collaboration between Trickers and END, the Newcastle based multi-brand clothes emporium. While it’s never easy to know where a collaboration starts and ends, it’s a safe bet to say that all the important shoe-related bits are handled by Trickers, and the styling and details are handled with aplomb. Using Trickers standard Bourton brogue as a starting point, using green leather uppers, and adding the contrasting Dainite commando sole. To me this results in a wickedly splendid pair of boots indeed. Handmade and Goodyear welted, with premium leather and punched brogueing, brass eyelets and full leather lining, in eye-catching green with funky soles. The only possible drawback is that unless you can follow up the boots with the rest of your outfit, you’ll be known as the weird gentleman with the green boots. Are you man enough for these? Made in Great Britain, squire. A late addition here, and actually a repeat of a boot I included in the Autumn/Winter post. It’s also the second pair of Fracaps in this post! The Fracap M127, what a magnificent piece of footwear. For Spring and Summer use as well? Why not? As rugged as they come, handmade in Italy. Super-comfortable Vibram lug sole. Leather uppers, fully leather lines, proper Goodyear welted construction and brass lacing hardware. Originally a model only for the Japanese market, it’s now also available for the rest of us. Irrestistable! Heck, they even include a spare pair of laces. Finfin blogg du har! 🙂 Har du noen tips til noen som foretrekker chelsea boots? Takk 🙂 Jeg ville sett på Dr Martens sine på Zalando. Rett under 1500, men med skikkelig såle så tåler de en støyt! Some good choices there Nick. I own the first three and like & wear them all. The only thing about the Yuks is the height – it’s sort of a tiny bit lower than a chukka and a bit higher than a regular shoe so I hear that some peoples ankles just cannot get on with them. 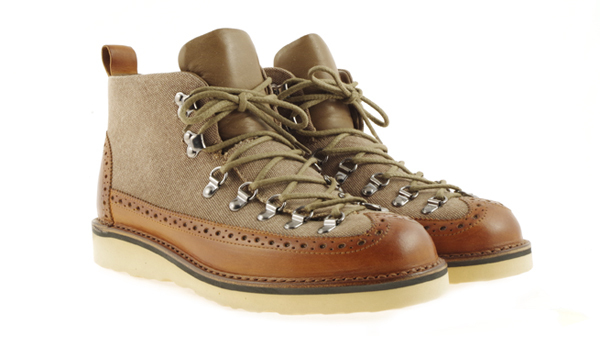 The Paraboot an “ousider entry” – how dare you – is a superlative shoe imo. A real classic and as usual built to last by Paraboot. The sole is more or less indestructable, they are very comfortable and have a singular look. This look is, I’ve discovered, not everyone’s sweetened cup of Yorkshire tea but if you’re over the age of 40 you’re sure to have fond memories of them from the 80’s when they were all the rage. Clarks I believe are made in China or Vietnam these days. Build quality is good and they look great. Despite having great affection & frankly far too many pairs of wallies these days, I usually wear crepe soled Yuketen Sports Chukka’s during the summer. Those Aldens are indeed awesome but you’re straying into the serious cash hemorrhage zone. I get a nose bleed just looking at them. Nose bleed shoes, eh? We´re talking serous here. I could not joke about such matters WDG.